Have you suffered from a whiplash injury accident? If you’ve suffered from a whiplash injury as the result of an accident, you may be entitled to compensation for your injuries, lost wages, and/or pain and suffering. Having a team of lawyers and experts on your side that are experienced with whiplash injuries, helps to make sure you receive the money you deserve for your injury. Whiplash is commonly referred to as: Whiplash, Whiplash Associated Disorders (WAD), and Cervical spine injury. i. Whiplash experts are necessary in cases where there has been a severe whiplash injury. It might be necessary for a physician to explain to the insurance company, judge or jury, the extent of damages your whiplash injury has caused. ii. Whiplash forensic experts are necessary when it helps to reconstruct the accident that caused your injury. A whiplash forensic expert may be used to testify about the various causes and risk-factors present in your case that may have contributed to your injury. 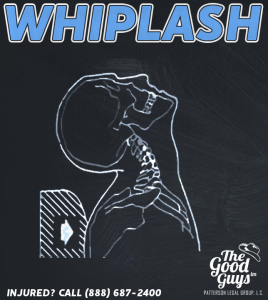 These experts help to explain the basic mechanics of a whiplash injury. A child who has suffered from a whiplash injury may be displaying symptoms in the form of interrupted sleep and nightmares, mood or behavior disturbances, poor academic performance, and fear of impact related play. Whiplash injuries in children often go ignored because a child may not have the ability to express the symptoms they have sustained. Studies consistently shown women and children are prone to greater damage resulting from a whiplash injury because of a smaller neck size. Also, positioning a seat closer to the steering wheel/airbag, or an improper fitting seat belt may both increase the risk of damage a whiplash injury can cause. The National Institute of Health (NIH) has classified Whiplash into 5 grades of injury. Here are the grades and warning signs present for each level. To properly evaluate a whiplash injury, it may be necessary for a medical professional to perform diagnostic imaging including x-rays, CT scans, MRIs, bone scans, and other routine lab tests. Symptoms include complaints of neck pain, stiffness, or tenderness only, no physical signs. Physical manifestation: no limitation on mobility or motion; no ligaments injured; and no neurological findings. Symptoms include complaints of neck pain and musculoskeletal signs indicating a decreased range of motion and tenderness. Symptoms include a limitation on motion, some physical ligamentous injury present, neurological findings may or may not be present. Symptoms include limitation on motion; ligamentous instability; neurological findings present; and there may be fractures or disc rearrangement on the spine. Symptoms require surgical intervention to manage/stabilize injury. If you have been injured in an accident resulting in a whiplash injury, time may be of the essence. An experienced whiplash lawyer may need to collect and preserve evidence which may be critical in your case. In some whiplash injury cases, it is necessary for a whiplash lawyer to collect evidence and document the accident scene and vehicles involved in the accident. This evidence is sometimes used by whiplash experts to reconstruct accident scenes or to put together the various elements that caused your injury. Methods used for treatment of injuries are also most effective if started early. Let us fight on your behalf for your whiplash injury to get you the compensation you deserve, while you and your doctor focus on your health and recovery. Compensation won’t erase your injuries, but it will help you get your life back on track. Call us today for a free consultation at (888) 687-2400. Cote PDC, Hogg-Johnson S, et al. Initial patterns of clinical care and recovery from whiplash injuries. Arch Intern Med. 2005;165:2257–63. Adapted from Foreman, S. and Croft, A.: “A Proposed Classification of Cervical Acceleration/Deceleration Injuries with a Review of Prognostic Research,” Palmer Research 1994; 1: 10-21. Kept up to date on case all along. Excellent communication and timely settlement. Good advice throughout. Did well and got it done for me.